4-Word Review: He has static electricity. 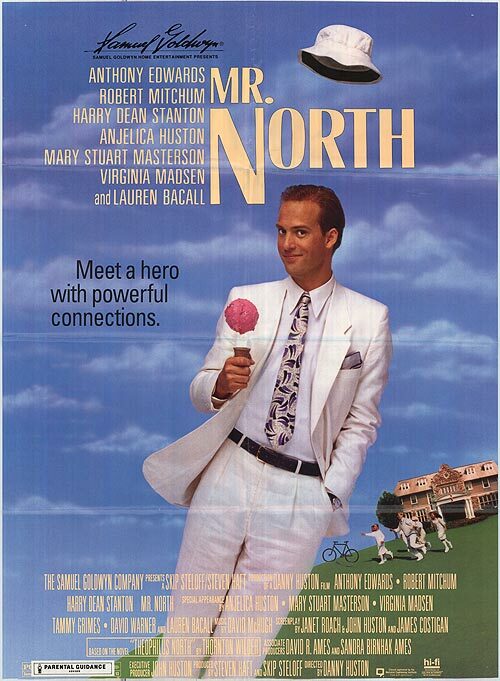 Theophilus North (Anthony Edwards) is a young man who arrives in the town of Newport Rhode Island in the 1920’s. He has little money or connections, but soon attracts attention with his ability to give off small electrical shocks to anyone he touches. Rumors abound that he can heal sick people with this power and everyone wants to meet him, but the town Dr. (David Warner) is not as impressed and accuses him of practicing medicine without a license and a court battle ensues. The North character is quite likable. He is self-assured, but never obnoxious or overbearing and is sensitive to everyone he meets and always seems to have wise advice to give no matter what their ailment or problem. However, he starts to get to be a little ‘too good’ and it borders on being annoying. It would have been nice to have seen him with at least one flaw or transgression simply to prove that he was human. His electrical charge ability isn’t all that impressive and the way people become so in awe of it is overblown and dumb. He also helps the Mr. Bosworth (Robert Mitchum) character who has a bladder control issue by giving him pills, which is nothing more than peppermint, but assures him it will ‘cure’ his ailment. Eventually it does suggesting that incontinence is a psychological problem, which is ridiculous as it is almost always a medical one and makes this an insult to anyone who suffers from it. The tone is pleasing and the recreation of the period is satisfactory, but the pacing is off. Nothing at all happens during the first hour and only slightly gains traction during the end. The scene where North gets chased by a mob of people looking for him to cure them is amusing, but seems to shift this otherwise whimsical fable-like tale into an all-out farce. The supporting cast is fun. Eccentric actress Tammy Grimes is good as Mitchum’s spoiled adult daughter who tries to make things as difficult for North as she can. Harry Dean Stanton puts on an very effective Limey accent and Lauren Bacall is interesting in a rare sympathetic role. David Warner is terrific as always as the heavy and it should have been played up even more. The film is directed by Danny Huston who is the son of the legendary John Huston who also co-wrote the screenplay and his sister Angelica appears very briefly. Unfortunately the film is too predisposed at being one of those ‘feel-good’ movies and in the process becomes formulaic and one-dimensional. The final result is a slick, but slow moving production that is empty and forgettable. 4-Word Review: Old man on lawnmower. 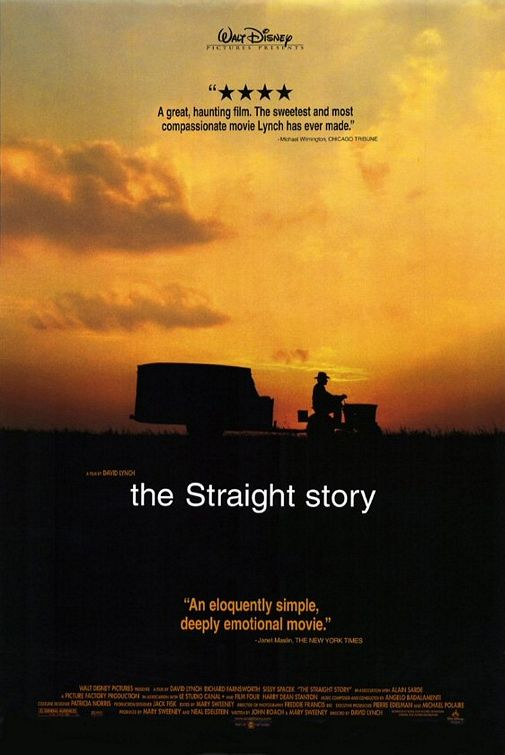 Richard Farnsworth plays Alvin Straight, an older man with health problems who decides to travel from Iowa to Wisconsin on a rider mower to visit his sick brother. This film is a true achievement. For every flamboyantly bizarre film David Lynch has done he equals it here with his restraint. He truly proves himself a complete director and a sensitive one at that. He shows a deep respect for his subject and the area. Nothing is overplayed or exaggerated. It is the type of film no one thought Hollywood could do. Based on a true story they go along the same route the real Alvin took. The drama is not compromised and everything is handled in a dignified way. It propels itself on the quite eloquence of his journey and the people he meets. The soft pace is stunning especially when you realize that it is still quite captivating. Farnsworth is perfect for the role. In many ways you feel he is Alvin Straight. He exudes so much of the same qualities of the character that you are convinced that they share some spiritual connection. His lines and little stories are both touching and powerful. Yet it is his deep expressive blue eyes that you remember the most. At any given time they can convey both his personal strength and sensitivity. Sissy Spacek is also terrific. Her portrayal of his mentally handicapped daughter is so convincing that you really can’t see the acting. This is an emotional film and one that makes the viewer feel good without being manipulative or using any of the old conventions. The simplicity is refreshing. The only minor drawback is the meeting with his brother. Talented actor Harry Dean Stanton plays his brother yet he is only given a few lines. You wish he had more and we were able to see a more complete relationship. Even so this is still a wonderful movie. 4-Word Review: Everyone watches her die. Based on the David Compton novel this story deals with Katherine (Romy Schneider) who is living in a futuristic society where almost all diseases can be cured and death is very rare. 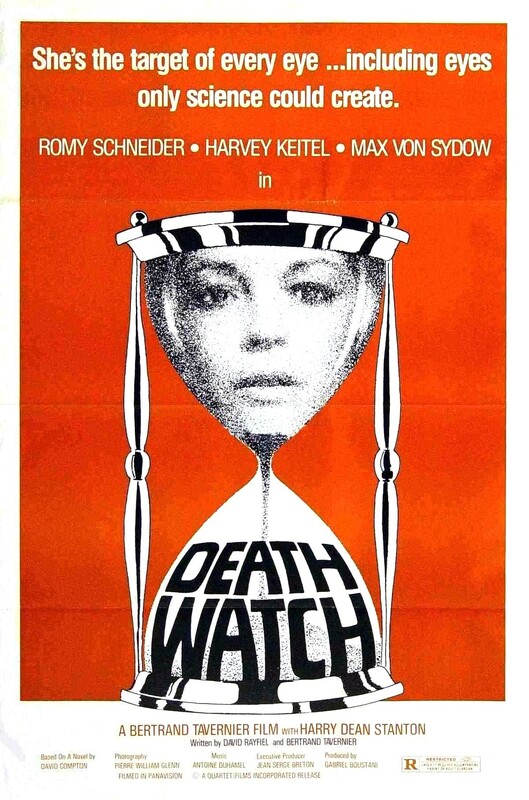 When she is diagnosed with having a rare and incurable illness Vincent (Harry Dean Stanton) tries to get her to appear on his hit reality show ‘Deathwatch’ in which they film in documentary style a person’s slow and agonizing death, which is a huge TV hit. When Katherine tries to escape the publicity and hide from their cameras Vincent has a small camera surgically implanted into the brain of Roddy (Harvey Keitel) one of his cameramen, which then allows Roddy to follow Katherine around and record her actions without her knowing it. The two then slowly form a relationship that culminates with tragic results. Director Bertrand Tavernier is in top form. The movie is nicely paced and Tavernier shows a perfect grasp of the material. His use of music wonderfully accentuates the mood and tone. 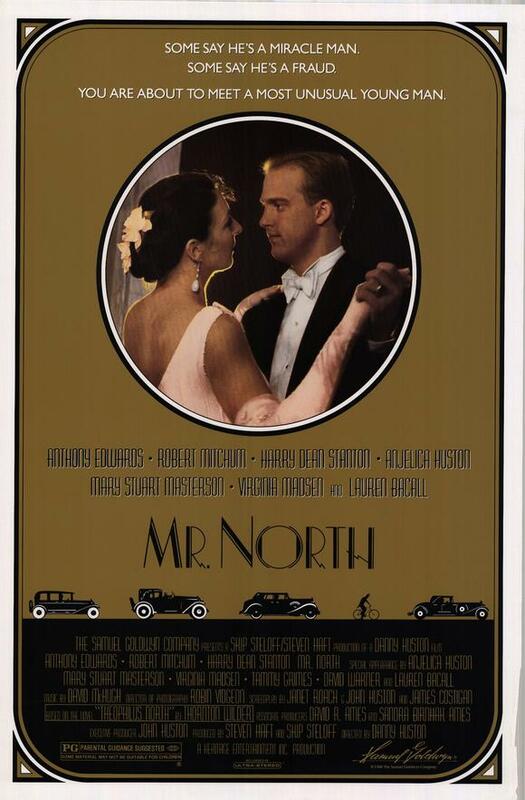 Filmed on-location in Scotland he captures the old buildings of the region with a stylish flair that gives the film an added personality and memorable image. Showing characters walking all alone in the seemingly abandoned streets hits home their loneliness and having the scenes done in decaying buildings and neighborhoods illustrates the decaying values and morals of the world these characters live in. The gray stormy skies brings out the pictures moodiness and the isolated shack in the middle of a vast empty field that the two hide out in captures visually the characters lost and hopeless desperation. The film becomes like an orchestral ensemble moved along by a talented conductor at the peak of his skill. This is also a great example of using a hand-held camera sparingly and only to create a certain mood, or emotion. Too many films these days seem to have what I call ‘the shaking camera syndrome’ and it is annoying and loses the original intended effect. Here Tavernier employs it during a scene where Katherine is trying to elude the production crew and the viewer feels her frantic tension with each move that the camera makes as well as getting a great cultural feel by capturing the various street vendors along the way. The story itself is fascinating and years ahead of its time. The issues it brings out about television, ratings, and the cutthroat ugly world of business of entertainment have never been more on-target. This film may even transcend the classic Network with its dire message and that is not easy to do. What I really liked though was the fact that the twists keep coming in layers and all of them are unexpected, but equally fascinating. The story is riveting and compelling from beginning to end. Schneider is brilliant and beautiful as always giving another one of her impeccable performances. Her character is easily identifiable and the viewer immediately gains her sympathy. She shows an array of different emotions and traits making her a fascinating three-dimensional person. Her presence is the main ingredient that propels the film and without her none of it would have worked and her gorgeous natural smile is wonderful and manages to come on display briefly despite the ugly difficulties of her character. Keitel is in fine form as well playing a character who finds that when one works for those who are more than willing to exploit others they themselves will eventually be exploited by them as well. Von Sydow appears near the very end and lends stature to the proceedings. I hate to bring this up because I love the film’s visual design, but I did find it a bit odd that the story is about the hi-tech future and yet all we are shown are old buildings and other gadgets that look very much like they are from the 1980’s. The computer that Katherine works on is laughably archaic and I felt from that end they could have tried harder to create a little more of a futuristic impression. Also, the name of the network ‘NTV’ sounds a little too much like the cable network that used to show music videos. The recent Blu-ray release from the Shout Factory is excellent and restores the film to its original runtime of 130 minutes. I highly recommend this to those who enjoy Sci-fi fare that is thought provoking and original.